How much does it cost to travel to Argentina? How much money will you need in Argentina? AR$2,652 ($64) is the average daily price for traveling in Argentina. The average price of food for one day is AR$420 ($10). The average price of a hotel for a couple is AR$1,996 ($48). Additional pricing is in the table below. These average travel prices have been collected from other travelers to help you plan your own travel budget. How much money do I need for Argentina? Argentina is a large, elongated country in South America. It's large size, impressive cities, popular festivals, and vibrant culture make it a top travel destination in South America. It is very diverse, and has both the highest and lowest points in South America. Cerro Aconcagua is the tallest mountain and Salinas Chicas (40m below sea level), is the lowest point in South America. Because of its large size, you can experience a wide variety of landscapes throughout the country that provide impressive beauty coupled with traditional towns. Patagonia is a stunningly beautiful area in the southern part of the country. It is an area that is absolutely not to be missed. It has, perhaps, some of the most dramatic landscape in South America, if not the world. Argentina also has some captivating cities that are filled with life, culture, and festivities. The country is relatively easy to travel around with an extensive bus system and a few trains connecting cities. It's possible to rent a car if you're looking for a more flexible travel experience, but it is definitely not necessary. You can also fly between most major cities, although during the peak seasons it is recommended that you book your plane tickets well in advance as they often sell out. There are any number of activities and things you can do throughout the country. If you're in the area during the winter months, there are some great ski opportunities in the Andes Mountains. Las Lenas and San Carlos de Bariloche are probably the most popular places to go. Football, or soccer, is also very popular. If you can purchase tickets to a game it's definitely an experience to be had. Wine is also very popular in Argentina. 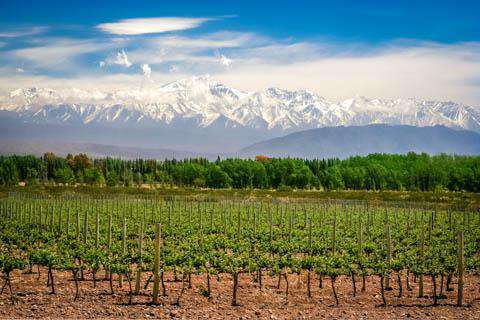 You can visit the wine regions in either Mendoza are Salta, both of which are quite nice. Although Argentina is one of the more expensive countries in South America there are some good tips you can use to save money. Many of the bus trips between cities are very long. If you take an overnight bus this will save you one night's accommodation. It can be a little uncomfortable however. Also look out for restaurants that have all you can eat buffets. These options are very filling and often a good deal for food. Also make sure you pay for everything in the local currency. This will help ensure you're not overcharged for your items. Argentina has a range of landscapes, from jungle in the far northeast, to the rolling plateau of Patagonia in the south. The Andes Mountains run along the border with Chile and in the central part of the country is La Pampa, or the plain. Each area has something unique and interesting to offer travelers, so if you can visit every area it is well worth it. Beginning in 2009 the government began charging "Airport Entry Fees", also known as "Reciprocity". Visitors arriving at the airport from certain countries are charged a fee based on their country of citizenship. At the time of writing this fee was only being collected at the two Buenos Aires Airports for incoming international flights. It was not collected at other airports in Argentina. It is also not collected for those arriving by land or sea. Citizens from the United States are charged US$160, Australia US$140, and Canada US$75. Buses are convenient and efficient throughout the country. They are also not as cheap as they once were. You can expect to pay about four or five U.S. dollars for every hour of travel time. Still, this system is more affordable than flying and more far reaching than the train system. Football is a popular activity and if you have the opportunity to go to a match then you should not pass this up. The five elite teams in the tournaments are referred to as the "Los 5 grandes" and include Boca Juniors, River Plate, Racing Club, Independiente, and San Lorenzo. Fashion and art are of great popularity in Argentina. If you have the opportunity to do any shopping you'll find some great stores with high end fashion. If you're in the city, definitely take some time to wander through some of the top shopping areas. Parque Nacional Iguazu: This park is on the Argentinian side of the Iguazu Falls. Exploring the area requires plenty of walking, but is well worth the effort. The park was established in 1939 and is one of the largest forest preservation areas in South America. In 1986 it was listed as a Natural Heritage Site of Humanity. Eco Yoga Park: Near Buenos Aires, this park offers many unique features at a convenient location. Many visitors choose to spend some time volunteering here, which can be a unique experience. Parque General San Martin: Located in the city of Mendoza, Argentina, this park offers both a lake and a beautiful rose garden that are very interesting to explore. It was created in 1986 and has continued to grow in popularity since then. Food in Argentina is heavily based on beef. It's one of the largest beef producing countries in the area and you can find delicious and hearty steaks and barbecue throughout the country. Although breakfast is usually a light meal, lunch is very hearty. Dinner is generally not served until 10PM at night, but there is also a tea that is prepared in the mid afternoon. Most restaurants do not begin serving dinner until late in the evening, so make sure you eat plenty at lunch. Chorizo: This is a popular pork sausage dish. It is occasionally made with beef instead of pork. It's often grilled and served with a side of bread, although it can be prepared in a variety of styles. Chimichurri: This is an herb, garlic and vinegar sauce that is often served with meat. It is most commonly found in the Patagonia area, although it is available elsewhere. Sandwiches de miga: This is a popular light, crustless sandwich made with buttered bread, cured meat, and cheese. It's often served at parties and is similar to a tea-time sandwich in England.